I first remember hearing Jimmy Dickens sing in the early 1950's. My next door neighbor, Millard Beckum, had an old Columbia 78 rpm record of "A-Sleeping At The Foot Of The Bed". We kids would play that song over and over, trying to figure out why in the world the singer would get his nanny goat to sleep at the foot of the bed. It just made no sense to us. OK, that makes sense.... IT GOT HIS GOAT.... an old southern expression. Here's another funny misunderstanding concerning Little Jimmy Dickens. Bill was writing about how performers are sometimes introduced on stage by the wrong name.... and he quoted Little Jimmy Dickens as saying he was once brought on stage by an emcee who said, "Here's Little Jimmy Dickerson... they tell me he's the king of the banjo!" Not only did he get the name wrong, but Jimmy Dickens has never played the banjo in his life. I've interviewed Jimmy several times over the years, and always find great pleasure in his company. 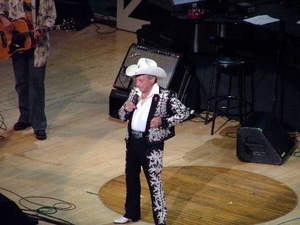 And you can still find him performing every week on the Opry. Happy 85th Tater, and many many more!